Collins Italian with Paul Noble combines an exciting, new non-traditional approach to language learning with the easy, relaxed appeal of an audio-only product. I can’t understand why anyone would think that Paul Noble is such a great language teacher. I literally fell asleep just listening to his “ground rules” on the audio sample on this page. I still ordered the program and continued sleeping through it as he droned on endlessly in a low-energy monotone. I don’t know about you, but I want to speak ITALIAN. If you’ve ever heard real Italians speak, you’ll notice that they are extremely HIGH ENERGY people with a lively language. To give you some contrast, check out the Power Italian 1 Accelerated by Mark Frobose. The free audio sample will explain why I think “Learn Italian the Natural Way” should be named “Learn Italian (Maybe) While You Sleep”. Power Italian is much better in every way. So is “Learn in Your Car Italian” by Penton Overseas. They blast you with a gong every now and then between lessons, but at least you stay awake. I also learned some Italian with a memory technique that’s almost as good as Frobose’s in Power Italian. It’s the famous Pimsleur programs, which are also quite good, but just use a very limited vocabulary base. 45 sur 50 personne(s) ont trouvé cet avis utile. The “ato” in “tomato”....come on. There are much better audiobooks to learn Italian than this British nonsensical garbage. What disappointed you about Collins Italian with Paul Noble - Learn Italian the Natural Way, Part 1? I did not feel this format was beneficial to me at all. It was a waste of money. very disappointed. I did not like the back and forth between the narrator and the Italian speaker. What character would you cut from Collins Italian with Paul Noble - Learn Italian the Natural Way, Part 1? 23 sur 35 personne(s) ont trouvé cet avis utile. Good structure and sets up core principles fairly well. My only complaint is the person doing the Italian pronunciation could have been more articulate. It is a little bit hard to hear at times. But I recommend it still. Good learning tool for beginners. Loved the narrator and the Italian lady who speaks clearly. This provides great instructions of how to conjugate words in an easy way and how to build useful sentences. Looking for part 2 now. This book is useless and unbearably boring. Can’t believe anybody could learn Italian following it. I regret having lost a credit in such a silly book. Painless and This Works, Really! 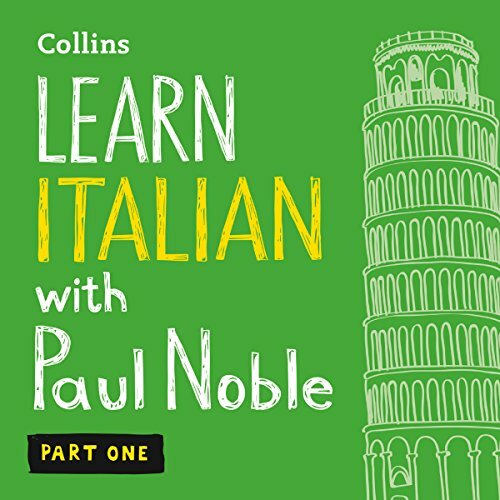 Where does Collins Italian with Paul Noble - Learn Italian the Natural Way, Part 1 rank among all the audiobooks you’ve listened to so far? This is not a story but it is a fabulous way to learn a language. Fully recommend this program. If you are worried that you can't learn Italian, stop worrying, start listening. Always enjoyed a British accent, bonus. What other book might you compare Collins Italian with Paul Noble - Learn Italian the Natural Way, Part 1 to and why? Not a story, educational. Closest would be one of The Great Courses. When he said....posse prenotare un camera con banjo? My heart melted. 12 sur 30 personne(s) ont trouvé cet avis utile. Gives you time to answer and the vocab is nicely spaced which means it is easy to recall and remember. 4 sur 11 personne(s) ont trouvé cet avis utile.